and explanations of my positions on some issues facing Olympia. People keep asking why I want to be mayor. It's because I believe deeply in public service and believe I'm the candidate with the strongest ability to lead during these tough budget times. After many years of working on statewide community development, I have enjoyed bringing my experience to my home, Olympia, during my past 18 months on the City Council. I appreciate Olympia's quality of life and the many creative and talented people who are willing to work to enhance it. As mayor, I want to bring the Council together as a team and move us forward on important issues facing our city. I urge everyone to be cautious when candidates promise to deliver on their agenda independently. Olympia City Councilmembers won't agree all the time; however, if we are to accomplish anything, it is necessary to collaborate, persuade a majority of the Council's votes for a proposal, and work closely with the city staff who implement our decisions. In addition to chairing Council meetings and ceremonial duties, our Mayor must be well-informed about the city's budget, programs and issues, as well as the state and federal resources available to help address our needs. I have a proven track record demonstrating this knowledge and the leadership skills to get things done. As Mayor, I will continue to do my homework thoroughly and encourage all Council members to do theirs. This includes listening to the public and our Advisory Committees, understanding our guiding documents such as city ordinances and the Comprehensive Plan, and reading all of the briefing documents we receive each week. I will work to create an environment where council members are comfortable asking for clarification, get as much information as they need to make informed policy decisions, and discuss issues thoroughly and respectfully during our meetings. I believe I could influence these practices directly as Mayor. During my time as Mayor Pro Tem (Deputy Mayor), I have built effective working relationships with city staff. While the Council is charged with setting policy, staff manage the city's day-to-day business. As Mayor, I would encourage staff to notify me when they believe city policy is unclear. I would also ask the Council to spell out clear performance measures related to city policies, so that staff consistently apply them and know what to report to Council, and so both citizens and staff know when expectations are met. These clear, respectful roles are essential to running an efficient and effective city government. Have a transparent budget writing process, with opportunities for citizens to give input about the hard choices. Focus on core city government functions, such as utilities and public safety. Avoid decisions that are penny wise and pound foolish, such as deferring maintenance on streets and city-owned property. Make sure each department in the city runs efficiently, while understanding that there are reasonable needs for overtime, such as clearing roads during snowstorms or fixing broken pipes on weekends. Invest in infrastructure to protect our environment, such as improving storm water treatment. Attract development that enhances our community, such as quality multi-family housing downtown and along our urban corridors. I support going to the voters with specific proposals to improve city services. If we clearly explain the benefits, citizens can decide if they are willing to pay for them. I would vote to increase my taxes a little to invest in our quality of life for the future, and many Olympia voters have demonstrated that they share this value by voting for small tax increases to fund parks and sidewalks, fire protection and public transit. Many people do not know that Heritage Park and Capitol Lake are owned by the state. Decisions about their future are made by the state Legislature. Right now the lake and connecting waterways are very unhealthy. The lake is filling in with silt; releasing the dam would push the silt problem out to the public and private marinas in Budd Inlet. All possible solutions are expensive. My goal is to ensure that the state's solution - whether a lake or estuary - maintains natural beauty, continues to provide public recreational opportunities, is environmentally sustainable, and doesn't just pass the costs downstream. We will have to collaborate closely with the state, federal government, tribes, the port and businesses to advocate for Olympia's varied interests in this issue. I support city investments that increase commerce in downtown and throughout Olympia. Reviving downtown is a long-term project. In my first 18 months on the Council, I have set the stage for downtown development in several ways. I helped city staff establish a $2 million community development low-interest loan fund for businesses and non-profits, which is new money the city hasn't accessed before. I secured funds to start our homelessness coordination program. Also, I've worked on connecting social service providers and law enforcement to influence how policing happens downtown, and help keep downtown user-friendly for all. One of the keys to economic vitality is producing more goods in our own community and educating consumers to buy locally. The Olympia Farmers Market is one positive example of this. Our unique downtown merchants are another. Local purchasing provides jobs, keeps our downtown interesting, and raises revenue for community services and revitalization. For next steps, we need to build on downtown Olympia's uniqueness. Our abundant theater and music and visual arts are currently concentrated in downtown; our civic decisions should support this, increasing the use of downtown as an arts and recreation hub, supporting local businesses and inspiring additional private investment. Recreational use will increase as the Percival Landing boardwalk is completed. I'd also like to see continuous pedestrian trails from Swantown Marina on East Bay to Rotary Park on West Bay, and from downtown to Tumwater Falls. Our urban interface with Puget Sound can provide opportunities for education and recreation if we minimize pollution and habitat loss. The City of Olympia can also help build up downtown businesses by working out better parking solutions and supporting public transit options such as the DASH shuttle. We can create cultural events that bring customers and business owners together to build the personal connections that encourage consumers to shop locally. I support creating a Community Renewal Zone which will help us remove some of the more daunting barriers to appropriate downtown development, such as soil contamination. I've obtained Council approval for city staff to draft the ordinance for this. Finding funds to invest in downtown will be a challenge in this economic climate. There are no magic answers, but I will continue prioritizing this and using the knowledge and skills I've gathered over my career to make sure that Olympia is maximizing all available state and federal resources. Promote on-site surface water management, rather than flushing it into local waterways. Support water pollution education programs such as Stream Team. Protect and expand our urban tree canopy. Protect and restore our shoreline and aquatic habitat, including avoiding or removing hardened shorelines where possible. Encourage targets for reducing the city government's and city-wide energy consumption and measure our progress. Support consumer education about what and how much we use, where it comes from, and how much it costs. Seek opportunities to build renewable solar, and possibly geothermal, power systems into the city's grid. Promote incentives for residents and businesses to invest in renewable energy. Support funding of transit, bicycle and pedestrian projects. Understand that most of downtown is close to sea level, like New Orleans. Develop a clear plan to address sea level rise and storm surges. Follow the most feasible recommendations from the Coastal Engineering study to be released in September 2011. Ensure we have clear information about future costs related to sea level rise as we plan downtown development. On each of these environmental issues, the City of Olympia can promote citizen awareness, making the case that our ongoing quality of life depends on investments that keep Puget Sound clean, expand transit services and conserve energy and resources. Though I opposed high-rise development on the isthmus during my 2009 campaign, I am not opposed to all development. I favor nodes of high-density housing with basic retail and service amenities along the major corridors downtown, and on the routes to Lacey and Tumwater. Urban density relieves growth pressure in rural portions of the county, preserves farmland, and enables expansion of transit services. I strongly support a regional "urban corridor" development plan. I support development of multi-income housing in several areas of downtown Olympia, each within walking distance of groceries and other basic amenities. Downtown housing also requires parking solutions, possibly through a private/public partnership. Use the Plan to direct our vision for community sustainability. Back the Plan up with detailed ordinances that "add teeth." Consider the Plan while writing the city budget, including funding to enforce related city codes. Regularly review our performance on the goals of the Plan. Expect city staff to use the plan to weigh the community's long term vision, not just individuals' profits, as they decide about building permits. Our Shorelines Management Plan is also being updated. I value development along Capitol Lake and Puget Sound that benefits the whole community, and attracts the public for recreation, supporting downtown commerce. I stand by the Council decision to limit buildings on the isthmus to a maximum height of 35 feet. And, of course, all waterfront development should be environmentally friendly. I believe in empowering neighborhood organizations to plan for their needs and suggest solutions for their problems. Neighbors should have a strong voice in city decisions that impact them, such as zoning, traffic flows and pedestrian safety. Neighborhood needs - such as sidewalks, parks, and bike paths - are what many people want from the city. These should have some priority in the City's budget, rather than waiting in line far behind pressure to widen streets to support new development. Since my election to the Council, I've met regularly with neighborhood leaders. After hearing their concerns, I pushed to strengthen the city's code enforcement. This change is cleaning up problems that were neglected for too long. I support formalizing mutually-beneficial relationships between our many effective neighborhood associations and the City Council. I'm a strong supporter of open, transparent government and, as Mayor, will ensure that our decisions happen in public. It is our job to make sure the public knows what we are doing and why. There should be no surprises. It is also our job to make sure we understand the range of public opinion on our city's issues. 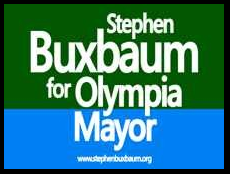 The Olympia City Council should inspire participation in public process. In my Council term, I've pushed for an improved relationship and increased information sharing with our citizens' advisory committees. I ensured that city staff support the work of advisory committees, but don't direct it. As Finance Committee chair, I've increased public input into our city budget writing process. The Council, and our city, is stronger when we maximize public input. As Mayor, I will lead the Olympia Council in working across Thurston County on issues that affect us all, rather than having piecemeal decision-making within each jurisdiction. Particularly, in these financially tight times, it makes sense to discuss sharing public safety and other services with neighboring cities or the county. Some good examples of how we do this now are Intercity Transit and LOTT wastewater treatment.